Guess what? Shake Shack London is serving halal chicken! 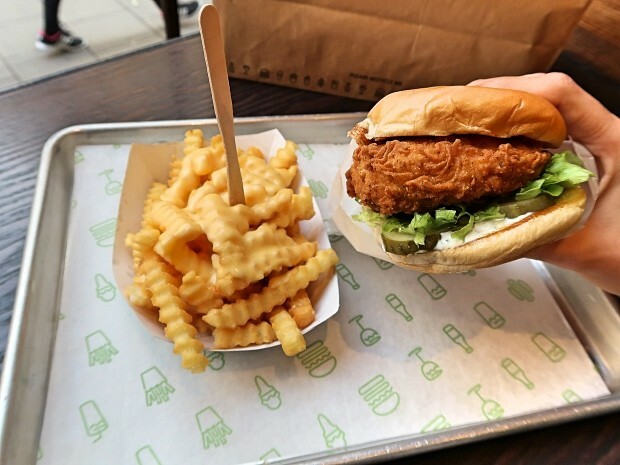 Earlier this month, Shake Shack announced that their popular Chick’n’Shack burgers will be launching at all their London outlets. A fellow foodie friend made a simple enquiry about halal in response to this news, and was informed that yes, the chicken would be halal. Astonished, he passed on the message to me, and my jaw dropped! Having now been publicly confirmed, I just had to get down there to check it out myself and of course, tell you guys all about it. I headed to the Tottenham Court Road branch, enquired about halal and any cross contamination, and was pleasantly surprised to find that yes, the chicken is halal and no, there is no cross contamination. Well, one Chick’n’Shack for me please! Oh, and cheesy fries too. 5 minutes later, my meal was ready. 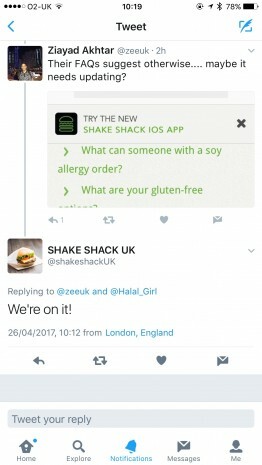 I was officially eating a halal burger from a London Shake Shack; I couldn’t contain my excitement! A thick, 100% British chicken breast is soaked in a spiced buttermilk, dipped in batter, dredged in flour, and deep-fried to a lovely golden crisp. It is then sandwiched between their signature squidgy potato bun with a slather of buttermilk herb mayonnaise, crunchy sliced pickles, and fresh lettuce too. 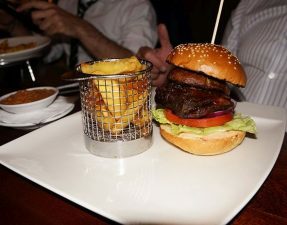 Biting in, the humongous chicken breast was juicy and the crispy, flavourful batter remained intact through every mouthful, with the soft, pillowy bun making a nice textural contrast. 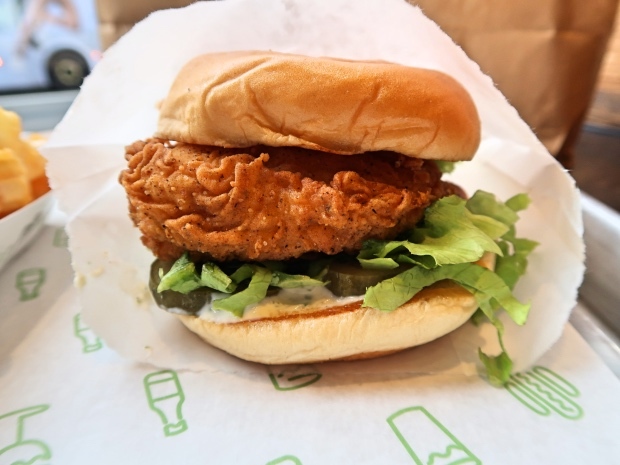 The buttermilk mayonnaise added a good tang as did the pickles, but a slice of gooey melted American cheese would have really finished this chicken burger off nicely, as would a slather of hot sauce (the U.S. Shacks hand out hot sauce packets!). 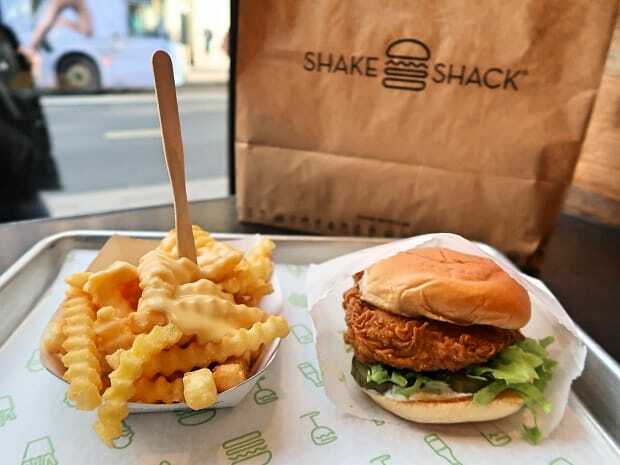 Sure, it isn’t mind-blowing nor does it beat their fantastic beef counterparts that I’ve had in Dubai, but when a London establishment like Shake Shack offer a halal option as good as this, well, I can’t say no, can I? There is a whopping price tag attached as one sandwich will set you back £6.25, but it is worth a try. 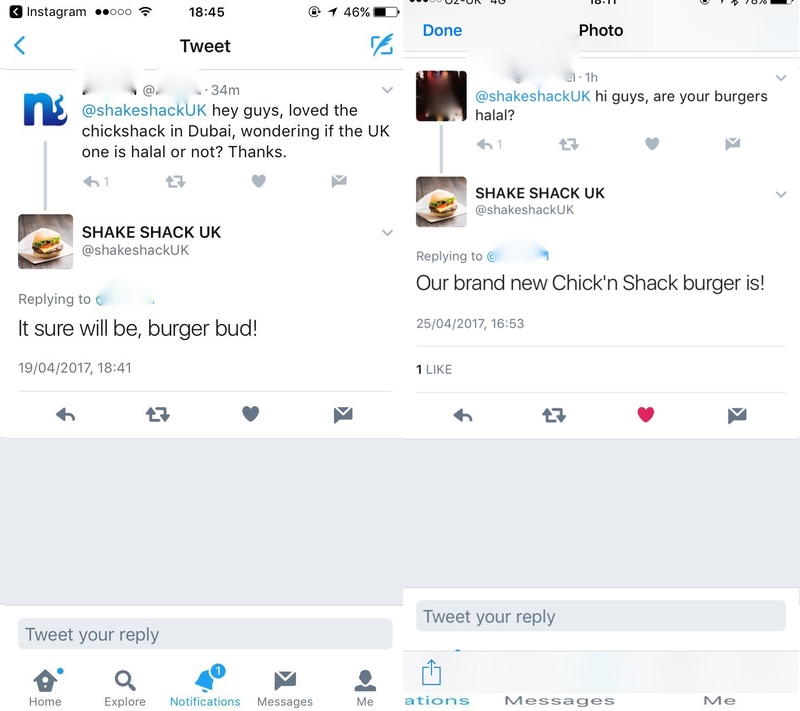 The Chick’n’Shack burgers are available now at most London Shacks: Tottenham Court Road, Victoria Nova, Stratford, Canary Wharf, and Leicester Square, and will be released at the Covent Garden Shack in the summer. 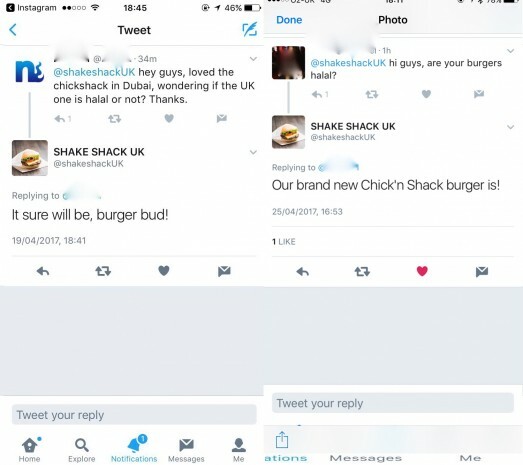 In fact, ALL U.K. branches will be serving halal Chick’n’Shack burgers, but please note that it is just the chicken that is halal, for now! 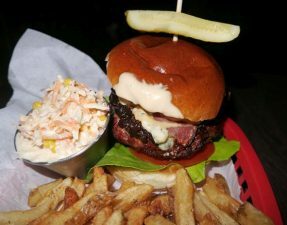 – Covent Garden will be serving the Chick’n’Shack in the summer. You should not eat at a place that serves alcohol at all if not go near it.As for alcohol, Rasulullah (Sallallaahu alayhi wa Sallam) said: “He who believes in Allah and the Last Day shall not sit at a table on which wine is served.” (Narrated by Imams Ahmad and Bayhaqi) This means that it is Haraam to be in an eating place where wine is served. If a thing is doubtful then according to Hadeeth, we are instructed to refrain from it. Indulgence in doubtful things will eventually lead to indulgence in Haraam. This is mentioned in a Hadeeth in Tirmidhi. Hanmah regarding the Hadith you cited. I’m not a Hadith scholar but I did read an article from a scholar which highlighted another interpretation to that Hadith, meaning as long as the wine/alcohol is not on your table then the issue is different. 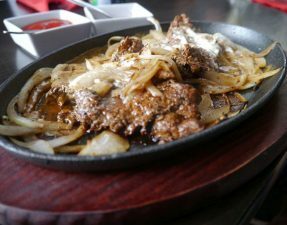 The sister on this blog makes it clear to everyone whether there is pork or alcohol at an establishment. You don’t want to go then don’t go. 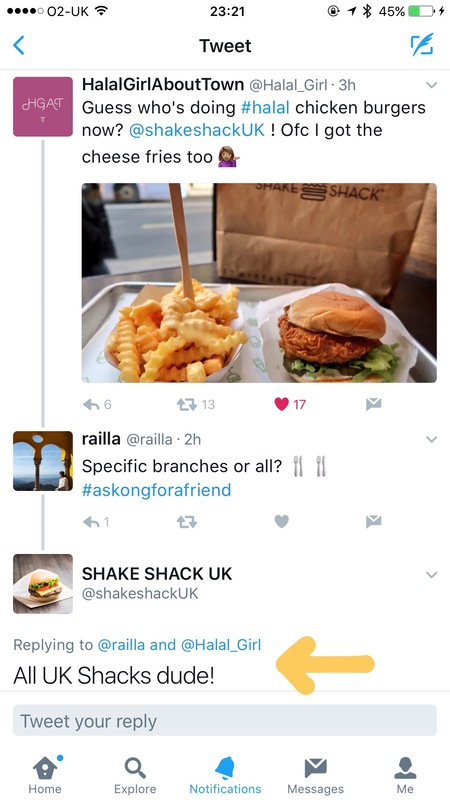 Please be advised that the Fries at Shake Shack are not Halal as they are fried with other non-Halal meat. I was told this by an employee at the Stratford Restaurant on Saturday 14 October 2017. The aforementioned Chicken Burger is Halal. Just to add the fries are also friend in their ‘famous’ beer fat. So they are unfortunately, not halal. There is another halal (and veggie) burger option in Shake Shack : the mushroom burger.